Everywhere I look right now I read about re-alkanising my probably too acid body, super powders, acai, cleansing (is that a euphemism? ), optimum ph, powdered greens to add to my wheatgrass juice etc etc. Now I am not knocking anyone who might want to add any of the above to their daily diet but in all honesty isn’t it easier, cheaper and just more real to eat vegetables. Surely these are better in their fresh, honest and original state than any dried, powdered, vitamin added supplement? As you see from these pages I try to cook seasonally and from scratch whilst still retaining a little fun and indulgence, balance being the spice of life and all that. I know I should probably eat more fruit and I definitely could do with more fish in my diet but generally I reckon we do ok. If I were to present my family with a glass each of coconut water or almond milk and ask them to add a sachet of revitalising, re-balancing green powder to it, well what do you think they would say? I have a rough idea. There are a million salads, juices, smoothies and soups doing the rounds but this soup is what I had for lunch today. Broccoli, spring onions and spinach were languishing in the fridge, a plucky mint plant is soldiering on in the garden despite the rain and I was given a box of lemons yesterday. I want to eat healthily but I also hate throwing away food. This was the result. I made a straightforward vegetable soup, the peas added a little sweetness to balance (!) the spinach, a spritz of lemon and fresh mint brought a hint of Spring to the party. A dollop of Greek yogurt added a perfect richness whilst the seeds gave crunchy, tasty texture. Clear your fridge and cleanse yourself at the same time. Happy New Year! As I said, this is what I had in the fridge today. 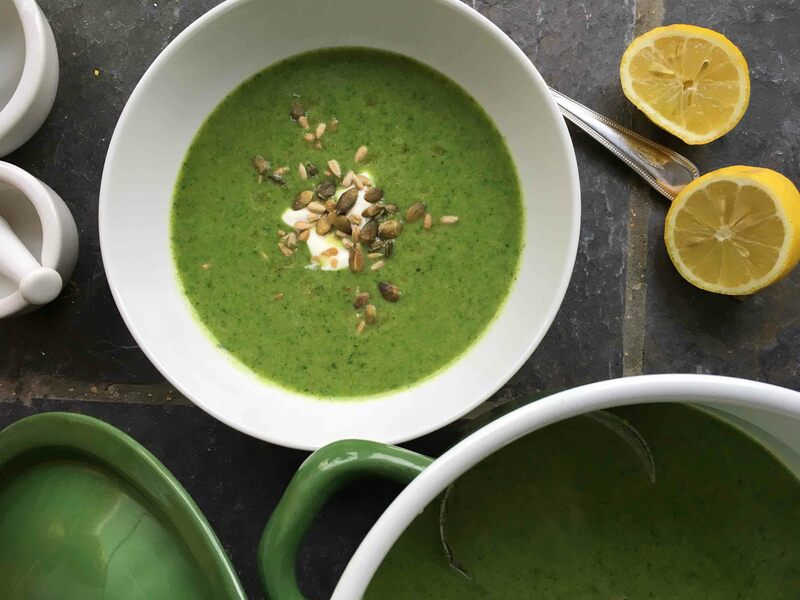 Previous incarnations of this soup have included leeks, watercress, courgettes and chard. All of these were probably looking a little past their best which is why they ended up in soup. Use whatever you have. There is nothing to stop you buying the ingredients specifically for soup but isn’t it satisfying when these end up on your plate rather than the compost? Heat the oil in a pan and gently soften the spring onion. Add the broccoli (you want it chopped fairly small to you don’t have to simmer it for hours) and the stock and cook for around 5 minutes until the point of a knife goes into a piece easily. Add the spinach and peas and cook for another 2 minutes, then add the mint and parsley if using. Stir so these are wilted and then blend. Serve with blob of yogurt, a good spritz of lemon and as many seeds as you like. Enough for 4 with something else or 2 if that is all you are having. Enter your email address to subscribe to Anna May Everyday and receive notifications of new posts by email.